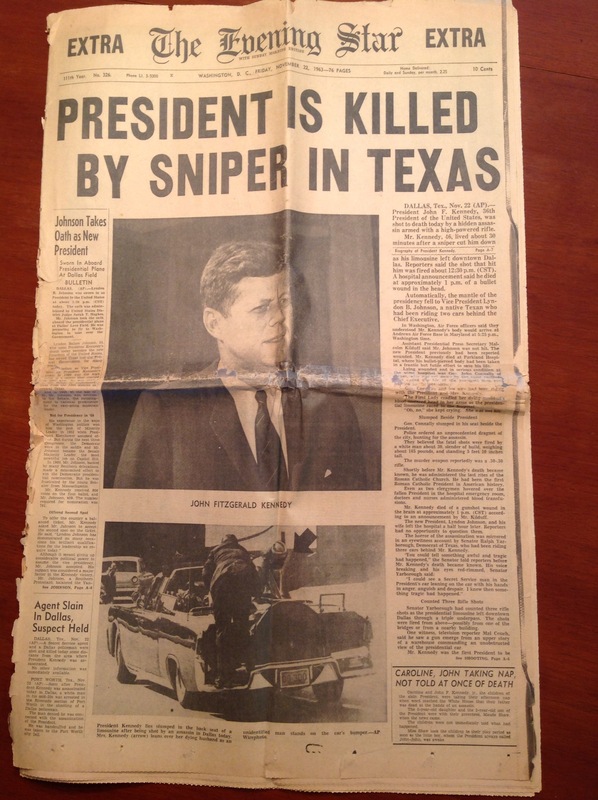 When my granddaughter called to ask me what I remembered about President Kennedy’s assassination for a school assignment she was working on, it triggered something in me. You may think it was the memories of the events of that day. Of course, that happened; but what it really triggered was a cold, harsh reality. I’m getting old. Middle-schoolers go to people my age to find out about the past. I’m somebody’s homework. I explained to Mia that when JFK was shot I was seven years old – a second-grader. The full impact was lost on me much like the reason why we had atomic bomb drills where we would crouch under our desks while the air raid siren blared. On that day, though, I remember our teacher crying as she sent us home from school early. I remember my parents being upset. I remember being sad for Caroline and John-John; he was such a cute little boy. It was strange to think that the president had a regular life as a husband and father. The weirdest thing I recall as standing out in my mind was the newspaper. The Evening Star had the words EXTRA, EXTRA across the top banner. This was odd and unusual enough to me that I saved the paper and have it to this day. Somewhere in the mind of that second grader was the realization that this was important and of lasting impact – a piece of history recorded for posterity. But, this is supposed to be a blog about Life on the Lighter Side, so with that in mind, I’ll let you know that my being my granddaughter’s homework was not the only thing that has reminded me that I’m getting older. As background, you should know that I am a huge Seinfeld fan. My son, Scott, sent me a notice that Larry Thomas, aka the Soup Nazi of Seinfeld fame, was going to be dispensing soup in a Publix in Kissimmee, which is clear across town. I was excited about going until I found out the time slot involved a return home during rush hour. Sadly, I’ll never know the intense pleasure of having my bowl filled with mulligatawny by a stern-faced soup ladler; and I’ll never know if bread was included or not. That may not seem like a big deal to you, but just a few years ago I stalked Paul McCartney, I mean had lunch with a friend while trying to get a glimpse of him at his hotel where he was staying across town. I also have driven across the state to hear my favorite author, Alexander McCall Smith, give a lecture. So it broke my heart a little to know that I wouldn’t brave I-4 traffic in order to see a Seinfeld character in action. Now that I think about it, it’s all about how you look at life. Maybe I’m not getting old. Maybe I’m simply having a season of personal growth. You know, counting the cost and realizing the value of my own time. Either way, it adds up to, “No soup for me!” Ah, but I can always catch Seinfeld in re-runs and ladle my own bowl of soup. Plus, there’s next to no traffic in my kitchen. Sounds like a perfect plan.